Broadcasters should embrace the coming RF and modulation changes because they will enable exciting new business opportunities. The FCC has set out a tight timeline for broadcasters to vacate the 600MHz UHF band, and now the goalposts are moving. With mobile carriers itching to start using the spectrum freed up by the repack, some players like T-Mobile have already sought to expedite the process by incentivizing broadcasters to move early. Pressure is increasing to complete the repack process quickly, and ATSC 3.0 implementation is just around the corner. Yet broadcasters should not see this as a challenge – it’s an opportunity. This is the ideal time to significantly upgrade infrastructure in order to meet the requirements of next-generation television, but only if they approach it in the right way. The big question in making this a reality, then, is how can broadcasters deal with the practicalities of packing up and moving to new channels without compromising reliability, performance, or future flexibility? For the majority of broadcasters, nearly all their RF equipment, from the transmitters through to the antennas, will need to be replaced in order to operate on a new channel. This is where broadcasters need to think carefully. After all, each piece of equipment in the RF chain has the potential to add value if the upgrade is used as a way to futureproof, and for taking advantage of the benefits associated with deploying the latest technologies. Let’s start at the bottom and work up. High power transmitters have undergone significant changes in recent years, with solid state transmitters now the norm rather than the exception. The new architectures they offer bring significant benefits, including a reduced footprint, increased reliability, low maintenance, and frequency agility. However, the advantages of solid state architecture are not always capitalized upon if the associated RF systems – amplifier rack combiners, mask filters, switches, and loads – are not considered together with the transmitter as a complete system. 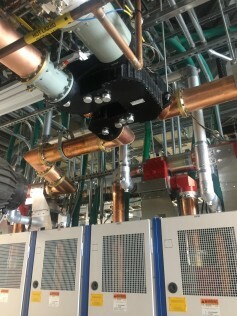 A compact 120kW power combiner, such as this one, can reduce the required site space by as much as a factor of sixteen. The result is that newer transmitters are often paired with legacy technologies, diminishing the benefits. Not only this, but as older systems are more cumbersome, broadcasters may not be seeing the benefits of compact systems which make better use of space and offer an associated cost reduction. Therefore, when addressing the repack, it is vital broadcasters look beyond previous system architectures to ensure they reap the full benefits of technology advancements. The inherent reliability of solid state transmitters allows for a move away from the bulky switching combiners that had previously been essential for tube type transmitters. With solid state transmitters, if a single amplifier module fails it does so in “soft failure mode”. The resulting reduction in output power is barely discernable, and full power is restored by “hot swapping” a spare amplifier module. This means the transmitter can be repaired quickly with no down-time and no requirement for high-power switching. The elimination of this switching requirement also means that new transmitters can make use of compact high-power combiners, bringing several racks of amplifiers into one RF output, without having to resort to the large and bulky waveguide combiners of days gone by. This offers the potential to reduce the required site space for the power combiner by a factor of typically sixteen times. 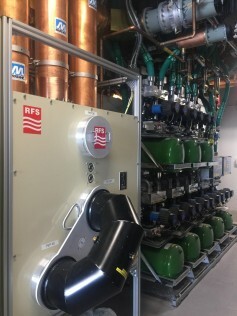 An installation of a 110kW compact RF switching system. Next, working towards the tower, we reach mask filters. Here, the phrase ‘only as good as your weakest link’ rings true. 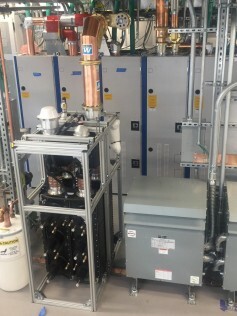 Because each new generation of transmitter improves power efficiency, it is vital that the RF system connected to the transmitter works to maintain that efficiency. Recent developments in mask filters take a unibody approach where the filter body is manufactured as a single piece. This eliminates soldered or bolted together connections in the filter, which can cause increased losses and reduce system efficiency. These benefits extend to the cooling of the mask filters too. The new approach in design allows for optimized thermal conductivity in key locations within the filter body, leading to a more even and consistent conduction and dissipation of heat. Highly efficient liquid cooling methods can be incorporated into mask filters. The result is increased power handling and an uplift in reliability due to the elimination of unreliable forced air blowers. Finally, new mask filter designs can reduce the required footprint and this has the potential to reduce the needed space for the mask filter by a factor of typically eleven times for a 90kW filter. A compact mask filter offers broadcasters improved efficiency and a reduced site footprint. Newer high-power UHF mask filters also deliver one of the most critical advantages for broadcasters striving to implement more efficient and hardworking equipment – flexibility. The modern version of 8-pole UHF mask filters are designed for operation on both ATSC 1.0 and ATSC 3.0 without any retuning, making them truly futureproof. These modern devices are tunable over the repack frequency range, meaning filters do not need to be manufactured for specific installation. This typically allows units to be stocked on the shelf, speeding up procurement and installation. With the help of computer-aided tuning software filters like this can also be tuned in less than an hour, which is essential when broadcasters are working to timelines accelerated by carriers that are pushing for an early repack. Antennas are where broadcasters face the biggest number of choices, but also the greatest potential to make the most of the repack and prepare for ATSC 3.0. Most stations will require an interim antenna during the repack while their main antenna is being replaced. This is an opportunity to be seized. Broadcasters should look to broadband antennas that can be used as an auxiliary antenna too. Features to look for are low wind load, easy installation for a speedy repack, and enough gain to replicate the main antenna effective radiated power (ERP) to reduce loss of reception during antenna works. Elliptical polarization is also a desirable attribute for future ATSC 3.0 use. Broadband slot antennas with elliptical polarization are an ideal option in this regard because of their gain, low wind load, and consistent radiation patterns throughout the UHF band. This type of antenna can be used on both pre and post repack channels, and gives broadcasters that much needed flexibility, particularly as they could be used for post repack transmissions should the main antenna not be ready in time for the region cut-over deadline. They could also be kept on the tower and used as a standby antenna after the repack, and are ideally suited to be used for future hosting of ATSC 3.0 transmissions without disturbing the ATSC transmission on the main antenna. For main antennas, some stations will use shared broadband antenna facilities that take advantage of advanced systems with variable polarization capabilities. The obvious initial benefit of this is lower cost of ownership as a result of shared infrastructure. Each broadcaster can also select their own polarization ratio, and change it at a later date, giving additional flexibility and the ability to optimize their resources without needing to invest in new equipment. Furthermore, those using variable polarization technologies (VPT) have an added edge. Elliptical polarization is highly desirable for ATSC 3.0 transmission as it supports enhanced delivery to portable devices. For broadcasters looking to prepare for the next-generation of TV and new transmission applications, embracing VPT technology gives the flexibility and performance they need. Despite the benefits of broadband antennas, the single channel pylon antenna continues to be the choice of many broadcasters across the USA due to its simplicity and low wind load. Although traditionally this class of antennas has had its limitations, these antennas have made huge strides forward. New design techniques and advanced RF simulation methods using advanced cloud computing have enabled complete antennas to be designed and tuned in the RF simulation environment so that the manufactured product will require almost no production tuning. The advantage is reduced lead-time and assurances when it comes to meeting installation project milestones – an important consideration for the repack. In the past, one of two different feed network architectures were selected for a pylon antenna. The result was a trade-off between either a stable elevation radiation pattern across the channel or smooth elevation radiation patterns with good null fill characteristics. However, new techniques have since been developed that provide the best of both worlds, meaning there is no longer a trade off when using new pylon antennas. When combined with elliptical polarization these highly stable and smooth elevation patterns provide superior coverage that’s ideally suited to repack and ATSC 3.0 applications. Broadcasters now have choices when it comes to building additional functionality into their systems. The industry is changing rapidly and traditional equipment that’s expensive to upgrade and difficult to adapt is no longer fit for purpose. Broadcasters need greater overall hardware efficiency and availability than ever before, and new technologies can deliver this. Broadcasters could wait until their hand is forced to become ATSC 3.0 ready, of course, but combining their modernization efforts for next-generation television with the repack makes much more sense. Nick Wymant, CTO Broadcast Division at RFS.